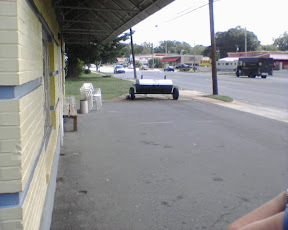 This morning my wife and I were driving to the tax office to pay our car taxes and passed by a little brick building with a cooker smoking away outside. I said to my wife, "That looks promising." After all it was about 8:45 am and the cooker was going. We got our errands done and decided to give it a try. 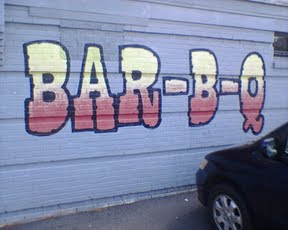 We pulled up and parked on the side of the building, which is painted with a large friendly "Bar-B-Q" sign on the side. We went in and talked for a little to the friendly waitress, and found we were the first ones there for lunch. She greeted us and informed us that there would be no fried foods today as the fryer broke this morning. No worries, we weren't after fries we were after BBQ. The building is an old grocery store that has been converted into a restaurant. 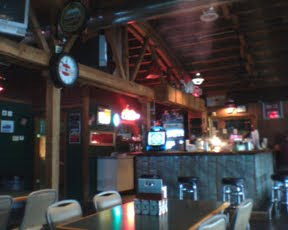 It's a neat building and the inside has that old school BBQ shack feel. We got ready to order only to find out they didn't have any ribs either. It was not looking good. The fryer was down and no ribs, but they did have pork, beans and slaw. We both ordered a large plate which is 1/2lb of pork and two sides. My wife got the BBQ slaw and the mayonnaise based slaw as her sides and I ordered the beans and BBQ slaw. Side note: BBQ slaw is a vinegar/BBQ sauce based slaw. I usually prefer it to mayonnaise based slaw. The food arrived. Simple styrofoam plate, paper bowl for the beans, and plasticware, except for the spoon. No frills. The pork was served unsauced, the way it should be. It had good flavor and not too smokey. It was good and smoked perfectly, not mushy and not tough. 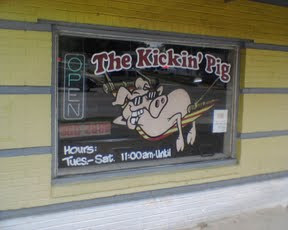 The Kickin' Pig has two vinegar based sauces a mild and a spicy. I like spicy but I think the mild had better flavor. When the sauce was put on the pork it only enhanced the overall flavors making it a great plate of pork. As I said before, I prefer BBQ slaw. I didn't care for this one though. I think they used ketchup in it and used too much. Their mayonnaise slaw, on the other hand, was good. I should have ordered that. Good flavor and good texture. The beans were good. Nice hint of smoke and BBQ sauce with enough spice to satisfy my need for heat. Would I eat there again? Definitely. My wife and I plan to go back to try their ribs. They also have a pig out combo that is 2 lbs of ribs, 1/2 lb of pork and all the sides. If you eat it all in 30 minutes you get your picture on their wall of fame. On the Gibbs Ribs scale* I will give it a solid 3/4 rack of ribs (for now), due to the issues with the fryer and no ribs. After we try the ribs I will update this rating. If you're in or near Rock Hill I would recommend giving it a try. I just tried it out for the first time this past weekend. 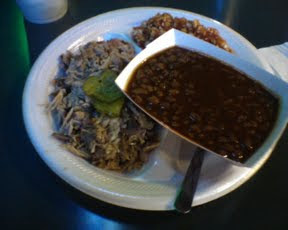 Got the small BBQ plate with beans and hush puppies. It had an excellent flavor!